I am a huge fan of John Maxwell. He has taught me many valuable lessons about leadership through his books, videos and training materials. If you haven’t read this book yet, you should. It’s short, simple, easy to read, and filled with great information. Even though the book isn’t about network marketing, it’s about being productive, effective and efficient. As the title says, it’s about making TODAY count. I think the information will help anyone reading this post who wants to improve their life and/or grow their business. Each quote is in bold and italics. At the end of each quote I also share my own two cents on the topic. Enjoy. # 1 You will never change your life until you change something you do daily. Ultimately, our daily routine will have the biggest determination whether we succeed at something, or not. We are all creatures of habits. # 2 You can pay now and play later, or you can play now and pay later. If you make some small sacrifices now, you will benefit later in life. If you avoid those sacrifices now, you will pay for them later in life. You choose. # 3 There are two ingredients necessary to make every day a masterpiece: decisions and discipline. Make the right decisions and have the discipline to follow through with those decisions, even when you don’t feel like it. # 4 Your attitude is a choice. Check your attitude every single day. Stay positive and happy. Remember that positive attracts and negative repels. # 5 Nobody can make another person happy. That was my job. If you are waiting for someone else to bring you happiness, you will never be happy. Make the decision to be happy. # 6 If you don’t decide how your day will be spent, someone else will. Learn how to master and manage your time or you will never make it as an entrepreneur. # 7 People don’t pay for average. No one wants to visit an average restaurant or business. People want to work with the best. Pursue excellence in everything you do. # 8 Experience isn’t always the best teacher – evaluated experience is! Take the time and reflect on each experience you go through, so you can learn from it. # 9 The more you stay in your strength zone, the greater your productivity and the greater your ability to reach your potential. Focus on things you are good at: your strengths. Delegate and outsource everything else. # 10 When I get ready to approach a day, I have the whole thing laid out. Hour by hour. Plan out your day and know what you are going to do each minute of each day so you can work smart and be productive. Remember that failing to plan is planning to fail. # 11 If someone can do a task I’m doing 80 percent as well as I do, then I hand it off. Delegate as much as possible. This frees up your time to focus on what you are good at. Don’t spend your $100 per hour time on $10 per hour tasks. # 12 One of the greatest causes of debilitating stress in people’s lives is doing jobs they don’t enjoy. It’s true, do something you love and you will never work a day in your life. # 13 The key to healthy eating is moderation and managing what you eat every day. Good health comes down to forming new habits and doing the right things day in and day out. The little things do make the difference. # 14 Building a solid family doesn’t just happen on its own. Creating a happy home life takes time, money and hard work. It must be a priority for you. # 15 Anyone who neglects or abandons his family for fame, status, or financial gain isn’t really successful. What good is success if you don’t have your family and friends to experience it with you? # 16 I found that it’s often easier to get the approval of strangers and colleagues than it is to get respect from those who know you best. Those who know us best are often our biggest critics. # 17 What makes families happy isn’t receiving things. It’s doing things together. Create memories with your family whenever possible. Your kids won’t remember what you bought them for Christmas, but they will remember the time you spent with them. # 18 If you intend to stay married only as long as you feel the love, you might as well give up… marriage requires daily discipline and commitment. Marriage takes hard work and a lasting commitment. You must make a conscious decision to keep doing the little things and keep your marriage a top priority. Otherwise, you will become a statistic. Don’t confuse lust with love. Love takes work. # 19 If something is worth doing, I will commit myself to carrying it through. Follow through and finish what you start, even after the initial enthusiasm fades. # 20 Your choices are the only thing you truly control. You can’t control what others think or do, but you can control what you do. # 21 Nothing stokes commitment like single-minded effort that results in achievement. Focus at all times and keep the main thing the main thing. # 22 People tend to value money and things over what’s really important in life: other people. Money comes and goes, but relationships and other people are what matters most. # 23 Your choice of profession affects your earning power greatly. The season when their earning is most effective occurs during their thirties, forties, and fifties. Choose a profession that you love AND offers a great income potential. # 24 Debt is one of the leading causes of divorce, lack of sleep, and poor work performance. Stay out of debt, especially credit card debt. # 25 The difference between the rich and the poor is that the rich invest their money and spend what’s left, while the poor spend their money and invest what’s left. Always pay yourself first. You can’t afford not to. # 26 If you have one true friend in life, you are very fortunate. If you have two real friends, it is highly unusual. I couldn’t say it better myself. # 27 If you want to make relationships a priority, you must check your motives to be sure you are not trying to manipulate others for your own gain. Don’t use your friends for personal gain. # 28 Your family provides the most valuable relationships in your life. Value your family above all else. # 29 You can’t tell the people you love how much you love them too often. If you have people in your life that you love, make sure they know it! # 30 The best way to help people is to see the best in them. Encourage and uplift others whenever possible. You might be the only positive person in their life. # 31 Greatness is not defined by what a person receives, but by what that person gives. True generosity isn’t a function of income – it begins with the heart. The more you give, the more you receive. Be a servant leader. # 32 Having values keeps a person focused on the important things. Show me how you spend your time and money and I will show you what you value. # 33 The gap between knowing and doing is significantly greater than the gap between ignorance and knowledge. Doing something is 100x more important than knowing how to do it. Applied knowledge trumps theoretical knowledge any day of the week. # 34 Growth is not an automatic process. If you want to grow as a person you need a personal development plan. It won’t happen by accident. # 35 The greatest handicap a person has is not realizing his potential. Stop selling yourself short and comparing yourself to others. Be the best you and make it a goal to get a little bit better every single day. # 36 The problem most people have is that they want things to stay the same yet also get better. For things to change you must change. Insanity is doing the same thing over and over and expecting different results. # 37 Focus on growing in your areas of greatest strength, not your weaknesses. Figure out what your natural talents and abilities are and focus on those things. John Maxwell is considered the # 1 leadership expert in the world. He’s also an entrepreneur, speaker and trainer. As of 2017, he’s sold more than 19 million books. You can visit his website here. 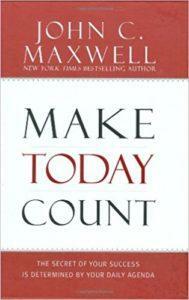 Make Today Count was first published in 2008. The ISBN is 1599950812. It features 160-pages and is available anywhere books are sold. As of June 2017, it has 112 customer reviews on Amazon with an average 4.6-star rating. Overall, I give Make Today Count a 9 of 10. There is so much wisdom in this little book. It’s worth reading 3 or 4 times a year, if you want to be happier, successful and more productive. There you have it folks. I hope you found my book review of Make Today Count by John Maxwell helpful. If you’ve read the book before, I would love to hear from you. What did you like most about the book? And, what is your favorite quote listed above? Leave a comment below to share your thoughts.